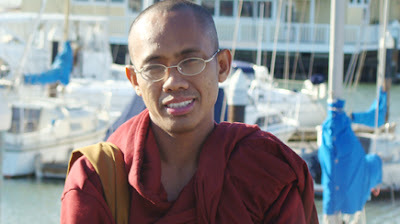 The Best Friend : "As long as I am alive I will struggle for freedom and justice in Burma"
"As long as I am alive I will struggle for freedom and justice in Burma"
U Agga Nya Na, now 27 years old joined the sangha at age 5. He moved to a monastery in Rangoon in 2001 to study foreign languages and was fully ordained as a monk there. He is one of the monks who expirienced the Saffron Revolution in 2007 first hand. After more than 1 month in hiding he escaped to Thailand where he testified to a delegation from the United States Congress and the Ambassador from the U.S. Embassy in Bangkok about the violent crackdown by the military regime on the peaceful protest. He now lives in Utica, N.Y., and continues campaigning across the United States for democracy and human rights in Burma. “My last dana, or gift, to my countrymen while in Burma occurred in the summer of 2007. On August 15, about nineteen years after the nationwide protests that resulted in my joining the Sangha, fuel prices doubled. This increase affected most commodities as well doubling the price of rice, and bus fares overnight. In response some students marched in the streets in protest, and the military arrested them. Then we heard that on September 5th five hundred monks in Pokko Ku, near Bagan, also marched in the streets. We heard that soldiers beat them and some were arrested. It took us thirty five minutes to reach Sule. Sule sits in the center of Rangoon in the middle of a roundabout with four street entrances. It is generally bustling with local people and full of merchants. On this day the streets surrounding the pagoda were a sea of saffron robes, with students walking beside us. Others who were not marching stood on their balconies or in doorways and cheered. The sight of so many monks in the streets encouraged many people. At Sule, some of the monks and students gave speeches. At first, the monks did not want the students to join because they were worried that the students would be arrested, but the students asked to join us. After Sule, we continued marching throughout the streets of Rangoon. We did this for about 5 days. On September 22nd, we got a chance to march by Aung San Suu Kyi’s house. I was so surprised on this day. I had heard that we would go, but thought it was just a rumor. Then when we headed toward her house, I expected the military would not allow us. Most of the monks did not expect it. But some of the monks negotiated and the soldiers let us pass. While confused by their actions, it was the most wonderful day for me. I got to see The Lady in person for the first time in my entire life. I had heard so much about her, how she promoted democracy in 1988, and was elected in 1990. But, because she has been under house arrest, I have never seen her outside. So when I marched by her house with the other monks and students, supporting all that she has worked for, she came out to pay respect to all of us. I was so happy to see her face and to pray for her. On the 23rd, I heard on the radio at the monastery before I left in the morning that the All Burma Monks issued a statement to the foreign media asking them to join us. However, this day when we attempted to walk by Aung San Suu Kyi’s house again, the military forbad us from passing. Their numbers by her house increased and they had put up more blockades. Instead, we marched elsewhere. The next day, many civilians joined us, more than on the other days. On the 25th, the military imposed a curfew. They announced the curfew on the state run television and urged people not to go out and march. Then at night, the military trucks went around Rangoon yelling reminders through a loudspeaker to remember that there is a law that no more than five people may gather at any given time or place. The next day we heard from other monks that the soldiers raided my friend’s monastery around midnight. We heard that they beat and arrested many of the monks. I tried to go to see my friend, to see if he was okay, but as I approached his monastery I saw that it was still surrounded by soldiers. When I saw them I was really worried for my friend, and sad for all the monks there. I felt sad for our country. We are a Buddhist country and the military rulers should not raid monasteries and arrest these monks who are revered by the people. I knew that the military leaders are not really Buddhist, but in namesake only. They just want to keep a hold on their power by pretending to be Buddhist to appeal to the people. If they were really Buddhist, they would not harm the monks. I felt that even under British rule, the rulers were not as brutal as this military and did not raid the monasteries. To this day I have not seen my friend, and do not know what happened to him. When I returned to my monastery we discussed what we would do, how we would run if the soldiers came. It was a day of fear. We talked to students around the monastery and asked them to keep watch for us, and to let us know as soon as they see soldiers. Later in the day, some students who had continued protesting that day came and told us of the days events. I was surprised to hear that monks were still marching. They told us that people were shot and beaten when they marched, and that one foreign journalist had been shot dead. That night, some civilians saw the soldiers coming and informed us to run away and hide. I quickly changed out of my robes to a longyi and a shirt that friends gave me and hid in the bushes near the monastery. It was a full moon, and I could see the soldiers patrolling. Some of the other monks hid in the trees or in the ceiling boards. Eventually the soldiers left as they could not find anyone, but we stayed in hiding all night. It was drizzling on and off. I just stayed in the bushes sitting, quiet. There were many moths, and leeches, but I did not realize it until the morning when I was bleeding and there were still leeches connected to me. In the morning I went to hide in a civilian house near the bus station. I could not sleep, as I felt that I needed to be alert. I heard from others that the military continued raiding monasteries at midnight every night. After two days, I realized that I was not safe. I was also worried about the people in whose houses I was staying. I didn’t want them to come to harm for helping me. A had a friend in a small monastery in Hpa-an, the capital of Karen State, and a friend bought me a bus ticket so that I could go there. I took the bus, still in my civilian clothes. When I arrived to Hpa-an, I changed back to my robes. I stayed there hiding in a village monastery for one month waiting for the situation to get better, but it didn’t. The military continued to raid monasteries especially those in Rangoon. I finally decided to go to Thailand, and I left in a bus by myself. It was November 4, 2007 when I arrived in Mae Sot, Thailand. I took a bus from the border crossing to the market. From there, I found a Thai monastery and explained my situation to the monks there and they let me stay. There were already some Burmese monks there who suggested that I change into orange robes while in Thailand. Some Burmese political activists who came to visit those monks also suggested that I go the UNHCR Office in Mae Sot for a refugee slip. After I got my refugee status, the activists from the National League for Democracy, Aung San Suu Kyi’s party, took me to live in a house with them and about three other monks who had fled. After about one month, there were many more monks, and we established a Saffron Revolution Monk Group. We found other monks who had fled and lived together in one place. By the end of December there were about ten of us, and later more and more came. Eventually we were thirty monks. Others fled to Bangladesh or India, remained in Burma, or had been beaten and arrested. While living in the house, two ladies who were working with a human rights organization came and interviewed with me. After living there for about two months, the two ladies asked if I would be interested in testifying to a delegation from the United States Congress and the Ambassador from the U.S. Embassy in Bangkok about what happened in Rangoon. I chose two other important monks who had witnessed a lot during the marches and we testified to about twelve representatives who were trying to investigate what happened. After we testified, an Official from the Embassy offered for us to live in the United States. At first it was only the three of us who testified, but later all the monks were invited. My two friends left in March 2008 but I could not come right away as I had to take medicine for tuberculosis. I sent a message to my parents through monks in Rangoon that I was leaving, and I arrived to the United States on January 28, 2009. Of all of my friends who entered into the monastery with me back 1988, I am the only one who has not changed to civilian life. Now I hear that there are still many restrictions on the sangha in Burma. I feel sad for the monks who are still there. We live freely and they have problems. Although the situation for the sangha is not like before, our protests were successful. After 2007, the international community is more aware about the brutality of the Burmese military regime. I am happy to speak out and raise awareness. 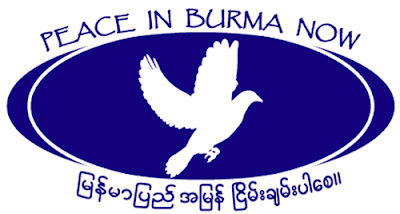 When in Burma we could not talk freely. As long as I am alive I will struggle for freedom and justice in Burma wherever I am and however I can.